VT-KFY (Airbus A321 MSN 3302). Photo by Vivek Kaul, used with permission. My flight on the 20th of December 2009 was a memorable experience. My friend, who was a first officer with the then 5 star airline, Kingfisher, had informed the captain (an ex-IAF officer) and the lady first officer that I was their passenger on their Delhi – Bangalore flight. Comfortably seated on 37A, I found the orange juice stain I had left behind on the same seat when flying from Bangalore to Delhi a couple of days earlier. Having been part of a huge “makeover” program at Honeywell, I was keen to gather flight data that I could possibly use for my training at the company. I sent out the “In flight form” to the crew members, scribbled on sheets from the hotel where the company had accommodated me. Most of the data is, as you will notice, from the FMS pages of the Airbus A320 family. VT-KFY, the Airbus A321, was the first, and till date, the only A321 that I have flown on. Branded with MSN 3302, and fitted with IAE V2500 engines, I was all too interested in the then 2 year old airplane. With the DGCA Cancelling the license of Kingfisher Airlines, this article is a tribute to an airline whose employees and flights taught me so much. VT-KFY, operating as IT-207 was planned to fly Delhi to Bangalore via airway W20S and W57S. W20S starts from the VOR at Delhi (DPN), and runs south-south east till Hyderabad International Airport’s VOR, HIA. W57S starts at HIA, and terminates at Bangalore International Airport’s VOR, BIA. Our take off was from Runway 28, which is westerly in its orientation. After take off, the aircraft has to join the airway, for which the Air Traffic System at busy airports provide what are known as a SIDs: (standard instrument departure), which are laid down procedures that specify how an airplane taking off from a particular runway may intercept and join a particular airway. In our case, the then effective AKELA 3B SID was applicable, which details how the airplane, after takeoff from Runway 28, may turn left to intercept waypoint AKELA, which lies on W20S. Airspace restrictions make W20S head south-south-west till waypoint KALNA, before changing direction to south-south-east towards Bhopal. This non-direct route between the two radio stations at Delhi and Bhopal makes an airplane fly 15NM extra. However, in practice, pilots request for a direct-to from AKELA to BPL, which, more often than not, is granted, saving around 10NM of ground distance. Upto waypoint IBANI, the aircraft flies in the Delhi Flight Information Region (FIR). Passing IBANI, the aircraft enters Mumbai FlR. Mumbai is around 420NM from waypoint IBANI, and yet, the airplane must be in contact with Mumbai Control, which is physically located at Mumbai. Communication link between the airplane and the centre, through direct VHF will not be possible, as a VHF radio’s range is limited to line of sight: around 200NM. Overcoming this problem are VHF transmitters positioned in the Mumbai FIR such that when a voice transmission over VHF occurs at Mumbai, the same VHF signal is broadcasted from multiple ground transmitters. This ensures sufficient coverage throughout a FIR. From BPL, pilots are often granted a direct-to all the way to waypoint VABDI, which saves hardly anything. 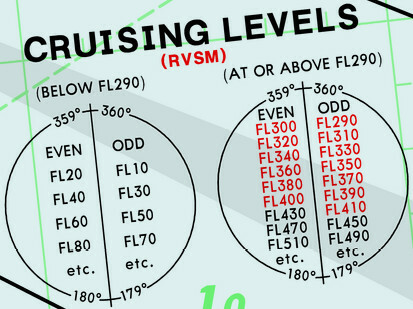 Since the route is easterly, even though slightly, ICAO specified RVSM cruising levels have to be adhered to. Airplanes flying easterly, must fly at “Odd” flight levels (FL). Example, FL 290, FL 310, FL 330, and so on. FL 290 stands for Flight Level 290, which is 29,000ft above sea level at an assumed barometric pressure of 1013.25hPa (hector Pascal) at sea level. Since it is an “assumption” that is followed by every airplane at the flight levels, all airplanes with their altimeters displaying 29,000ft with the assumption set in the altimeter, are flying at the same altitude, through the true altitude may differ by as much as 2000ft from the displayed altitude at this “Standard Barometric” pressure of 1013.25 hPa. About 20NM from waypoint BUSBO, the aircraft is “released” from Mumbai control and “handed over” to Chennai Control, where pilots may contact the physical centre at Chennai (approximately 400NM away from BUSBO) on one of 11 VHF frequencies. Observing the route, the direction changes toward the west (south south west) over waypoint VABDI. However, back then, when Chennai did not have sufficient radar coverage, airplanes on W57S needed to either climb 1000ft or descend 1000ft over Hyderabad. This was to change the cruise altitude from an ODD flight level to an EVEN flight level earlier than VABDI, for surveillance reasons. As far as our flight was concerned, we descended from our cruise level of FL 350 to FL 340 over Hyderabad. We approached Bangalore from the north east, and the active runway at that time was 09, which is east facing. We were “vectored” (given compass headings to follow) by air traffic control, and “broke off” from W57S in a divergent heading. This was to take us further west, before directing us to intercept the ILS for runway 09. The airway distance between Delhi and Bangalore is 950NM. However, with the standard instrument departure and the arrival into the airfield, the total ground distance increases to 980NM, which is an extra of 30NM. With the soon to be introduced RNP route between Delhi and Bangalore, this sector’s ground distance shall reduce significantly. VT-KFY, for that day’s flight to Bangalore, weighed 79 tonnes, as against its all up weight of 89 tonnes. 14.5 Tonnes of fuel was uplifted, and the centre of gravity was determined at 24.7% of the Mean Aero Dynamic Chord (MAC). Permissible range is 15% to 35%, with a preference for a rear CG to improve fuel burn performance. Corresponding to this CG, the horizontal stabilizer was trimmed for nose UP to an Airbus defined position of 1 unit. This is to keep stick forces (on the pitch axis) almost neutral during takeoff. A quick look at the Flight Crew Operating Manual for the A321 reveals that for a 980NM flight at FL350 (assumption: no winds, wind data on that day wasn’t collected), the A321 with a takeoff weight of 79 Tonnes burns approximately 6600kg of fuel for the entire flight from takeoff to landing. Approximately 200kg is burnt during startup and taxi, raising the estimated fuel burn to 6800kg. The estimated flight time between take off and landing is 2 hours 22 minutes. The difference between the uplifted fuel (14,500kg) and the trip fuel (6800kg) was huge: 7,700kg. Bangalore’s ATF rates being higher than Delhi’s, 7.7T of fuel was “tankered” to Bangalore, which was to be used up for the next day’s flight to Delhi out of Bangalore. A Cost Index of 18 was used for the flight. The Cost Index is a measure of the cost of time v/s the cost of fuel. The unspecified unit is kg/min, which in this case translates to 18kg of fuel being as costly as 1 minute of flight time. If the cost of fuel was low, the cost of time relatively goes up, which increases the numerical value of the cost index. If the cost of fuel goes up, the cost of time in comparison pales, lowering the numerical value of CI. Last year, most flights by Kingfisher were operated at around Cost Index 10. Lower the cost index, slower the airplane flies. For our flight that day, CI 18 corresponded to a cruise speed of Mach 0.775 under no wind conditions. There must not have been any significant winds, as the aircraft’s FMS targeted the same Mach number for cruise. Takeoff was planned with “Flap configuration” 1+F, which is the first of four selectable “configurations” on all in-production Airbus commercial airplanes. 1+F corresponds to 18° of slats and 10° of flaps on the A321. Lower flap settings provide better fuel burn and climb performance. Because the airplane was taking off 10 tonnes lighter than its maximum, full engine thrust for take off wasn’t required. Although the outside air temperature that night was 15°, the engine was told to produce a thrust corresponding to an outside air temperature of 44°C. Specifying a higher temperature reduces the generated thrust, saving engine life through reduced operation at the extremes. The thrust was “flex(ed) to” 44°. With this thrust setting, the specifics of Runway 28 at Delhi, weather and the weight of the airplane, the aircraft’s take off speeds were determined as V1 : 152kts, VR : 152kts, and V2 : 156kts. V1 is the decision speed. If anything was to have happened that demanded the take off to be rejected, the decision to reject must have been made before the airplane reached the decision speed of 152kts. Attempting to stop the airplane beyond this speed is unwise, as the combination of aircraft energy and remaining runway length will prevent the airplane from stopping before the end of the runway. Vr is when the pilot pulls back on the stick to “rotate” the nose up into the air. V2 is the takeoff climb speed: the speed that is maintained on the initial climb out phase (when gaining altitude is important) before building up further speed. Delhi’s airport is at an elevation of 777ft MSL. Takeoff thrust and take off speed (usually V2 + 10, 166kts in this case) was maintained till 1000ft above ground level, or 1720ft above MSL. At that point, the thrust was lowered to climb thrust, and the nose pitched down to maintain the same speed (V2 + 10), till 1500ft above airport elevation, or 2277ft in this case. Passing this altitude, the nose was further lowered, to build up airspeed. As the airspeed built, the flaps were retracted to “clean up” the aircraft, allowing for further acceleration. The best lift to drag speed is realised at the “O” speed, which was 217kts on that day for the given aircraft weight. The Cruise Altitude of FL350 was determined by looking for the optimal cruise altitude at the aircraft’s weight and weather conditions. Least fuel burn is expected at the cruise altitude. Since the aircraft was flying east, the ODD flight level closest to the optimum altitude is chosen, which, in our case, was 350. For the A321, the time to this cruise altitude, under ideal conditions at 79 tonnes, takes 25 minutes over 160 NM , burning 2000kg of fuel. Air Traffic Restrictions normally prevent most airplanes climbing out of Delhi from reaching their cruise altitude this early. Reaching cruise, the aircraft became lighter by 2 tonnes, reducing its weight to 77 tonnes. At this weight, at FL350 under ideal conditions, the airplane guzzles around 2800kg of fuel per hour, at Mach 0.78 (450kts ground speed). Considering that the aircraft needs at minimum around 100NM to descend, and 160NM to climb, 720NM at best is traversed at cruise. This implies approximately 1hr 30 minutes in cruise, burning 3,200kg of fuel. Starting descent, VT-KFY might have been around 73,800kg heavy. Interestingly, a light airplane descends faster. Descent from FL350 at continuous IDLE thrust takes about 17 minutes over 100NM by an A321, under ideal conditions, at the specified weight. Our A321, for landing, was configured with full FLAPS, which corresponds to a slats of 27° and flaps of 25°. The approach speed, at the estimated landing weight of 73,000 tonnes, was 142kts. Kingfihser later adopted CONFIG 3 landings, which extends slats / flaps to 22°/21°, offering lower drag and saving fuel. The autobrakes were set to Low (LO), one of three positions: LO, MED, HIGH. No Thrust reversers were used for landing, which was, and still is part of fuel saving procedures the world over. Really you are incredible….. an experience of 3 years ago, you had remembered it so well and you have kept the details in a very organised way. I liked the article because it was also dedicated to kingfisher ( I had worked in kingfisher at Hyderabad base). you write wonderful articles about the technical aspects in aviation. I would like to know more about the route designators (Ex- W20S ) regarding what is ‘W’ and ‘S’ and how is it transmitted in RT terminolgy. W20S : “Whiskey Two Zero South”. 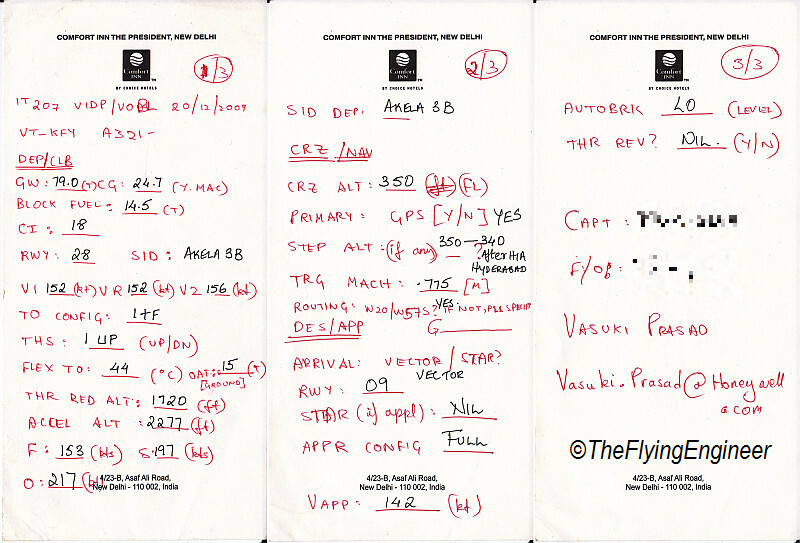 W20 was an airway originating/terminating at Chennai/Delhi. With increased air traffic, the route had to be spilt into North and South routes, which are used by airplanes flying North (toward Delhi on W20N) and South (from Delhi on W20S), respectively. Fantastic! Need More of these!